WaterfallNow is an experienced group of artificial rock water feature artists that works with clients that want the best in custom water features. Whether you are a designer/architect, or a home-owner looking to spruce up your living space WaterfallNow can provide the outdoor or indoor water feature design ideas you need to inspire you to make your dreams come true. WaterfallNow truly creates custom works of art for any budget. Typically our clients are those who have the budget to let us maximize that project to bring out its full potential. For those who cannot go without having the sound of trickling water or a stream of water on their property give us a call to see what you can have done. Do you enjoy the sounds of trickling water? We do. Maybe you like the energizing sounds of a rushing torrent of water? We like that too. Can’t decide which one you prefer? Ask us about a free quote. We will work with you to design something within your budget. We work with any budget to give our clients something they can enjoy for many years to come. Our water features even increase property value. If you are looking for unique indoor water feature design ideas you are in luck. Why? Because you’ve just discovered WaterfallNow! WaterfallNow can create specialty works of art for all of our clients to match and fit your interior design needs. Are you an architect, home builder, or designer with plans to enhance a living space with the addition of an attention-grabbing indoor water feature? Contact us for a quote and take advantage of our great deals. 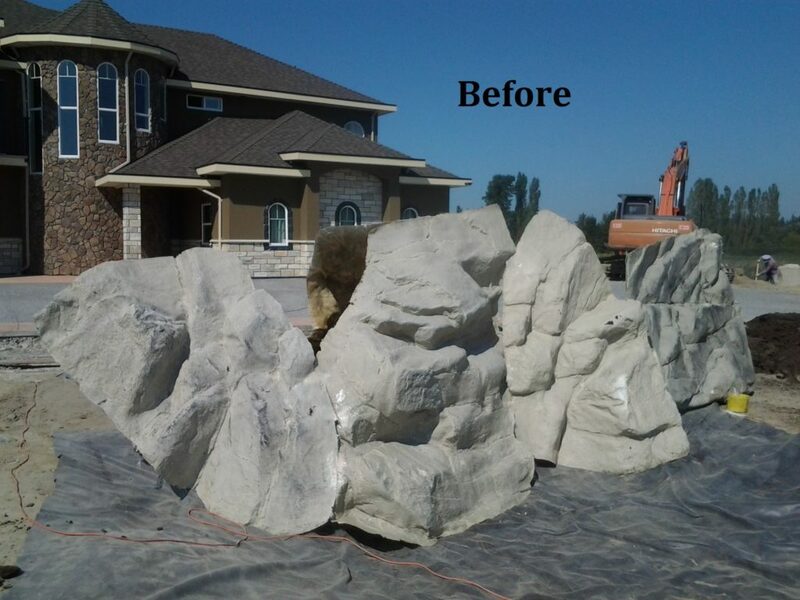 Our rocks are so versatile that we can work on any project any place, any size, and any shape. By taking our rock panels, cutting, bending, folding, and patching them together we can theoretically re-create an entire cliffside. Natural stone tends to be limited with finding the right the size, shape, or colour. Areas such as Surrey, Burnaby, or Richmond where are not as fortunate as North Vancouver, West Vancouver, or Whistler with the close proximity to natural rock formations such as cliffs and rock walls. Concrete is often out of the question when it comes to indoor water features not simply because of costs but potential maintenance nightmares. If going for a concrete water feature located indoors it is advised to do so during the construction of the building and securing all potential leakages. We have heard the horror stories of people who have had a concrete waterfall that was not created properly. We aren’t sure what the exact cause of the leakage was but it may have been something to do with the tiny pores in the concrete itself. We have seen several of these in people’s backyards that were not running. The common response to why the waterfalls were not running was maintenance related. Ask the contractor for samples of their experience with creating outdoor and indoor water features. If you currently have a concrete pool or concrete waterfall with a basin that has issues holding water you may need to reapply a gel coat. Vinyl Ester resins are common for this type of repair. Polyester resins are priced higher and usually aren’t used as a gel coat. Provided that you are doing your own labour you can do this for a few hundred dollars. Fiberglass pools tend to be a good option from the start as the long-term reductions in maintenance costs will eventually outweigh the initial savings. They won’t tell you this upfront. Concrete pools are undoubtedly beautiful but fiberglass pools are becoming more common. As long as you ask and have an idea of the potential maintenance costs you will be fine eitherway. Other things to consider is the proximity to trees and other roots. Concrete once set tends to be a permanent fixture. If you are considering an outdoor water feature ensure that the feature will not be in close proximity with large tree roots or roots from newly planted trees that may crack the structure. Even the smallest weeds and roots can crack concrete or asphalt as can be seen in many unkempt driveways and sidewalks. Roots from trees that grow along or near concrete can create enough pressure to eventually begin affecting the structural integrity of your waterfall. Another potential pitfall with some concrete designs is cracking from freeze-thaw. Amateurs such as ourselves when we first were creating rock features using concrete many years ago found that even the smallest lumps could cause a concrete rock feature to crack completely over the winter. Fortunately this rock feature was not created for a client but for ourselves. The cause was simply due to water and ice accumulating in the pores and holes and expanding causing the structure to break and chip. We eventually discovered fiberglass as an optimal solution. They are simple to use and versatile which makes serving the customers needs that much smoother. They are flexible and have a lot of give to them. The beautiful thing about fiberglass is that repairs don’t have to cost hundreds or even thousands of dollars. Often times our former clients call us for upgrades to their existing water features to change the color or make them bigger by adding more panels. One of the downsides to fiberglass is the perception of it being less permanent. For outdoor commercial purposes it is a safer bet to go with concrete water features because there will inevitably be people that will stand on or sit on the water feature. Despite this downside we have not had many issues with property damage to our rock features. Should something happen let us know right away and we will patch and seam the damages back to normal. Want insane overhangs and realistic rock patterns taken exactly from natural rock walls? There are hundreds of different fake rock panel designs to choose from. When you have this kind of flexibility it makes coming up with indoor water feature ideas that much easier. WaterfallNow builds unique custom water walls using artificial rock panels. Despite being larger and much more beautiful our projects currently cost less than our competitors. When it comes to water walls which can be purchased through a wholesaler online or from a local dealer you are often limited to wall-mounted units. I am a fan of wall-mounted water walls as well though they lack the exact sound that is often associated with other waterfalls or water features. The benefit of choosing them is their modern design which often better-matches contemporary architecture. They are however not our passion. The team at WaterfallNow enjoys creating true custom work on-site for all clients needs. It is a satisfying feeling to have worked on a project on-site, plug in the power, and see a beautiful man-made waterfall come to life. Whether you prefer the soothing and relaxing sounds of water trickling down a rock wall or the white noise provided by a waterfall (for a lobby) that can drown out traffic and other related noise simply let us know. 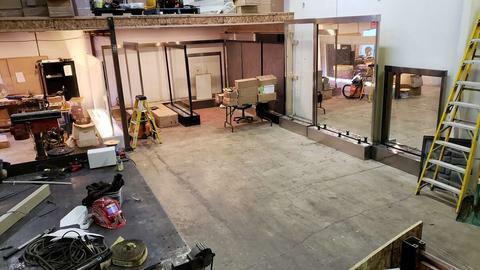 We will draw out a plan, find the necessary parts and pieces, provide all the lighting, pumps, plumbing, and everything else needed to create your waterfall or water feature. Pricing is based on the amount of rock panels required, labour required, indoor/outdoor, amount of preparation work done, customization (lighting, mist, fog, fountainheads etc), degree of difficulty, indoor or outdoor, and location with high traffic. Have a great location that you would like to feature one of our waterfalls? We will provide you with an excellent and unbeatable offer. Are you an architect tasked with creating a large commercial project? Don’t think that WaterfallNow lacks the ability to work on larger projects. There is little difference in the time it takes for WaterfallNow to create a medium project from a large project. We will in the future provide more photos and videos of our work for your benefit. Look for a fresh set of samples by summer 2014 for both outdoor and waterfalls. We will have more indoor water feature design ideas for your interior waterfall, water wall, or fountain needs. Don’t wait until our prices increase. Take advantage of our low introductory rates this summer.